The 1SKB-SC56 fits Les Paul© guitars and similar styles, and offers the superior protection of the very same rigid foam inserts found in our hardshell guitar case line, but with the style and portability of a soft gig bag at an affordable price.SKB Soft Guitar Cases feature a rugged, weather resistant 600 Denier ballistic nylon exterior with a hard-core EPS foam interior to provide more substantial protection than a conventional gig bag.The exteriors feature two zippered pouches, one with numerous internal compartments for organized accessory storage, and an adjustable padded backpack strap for easy transport. The hard foam interiors are plush-lined and offer full neck support to cradle the guitar neck more securely than a conventional bag. 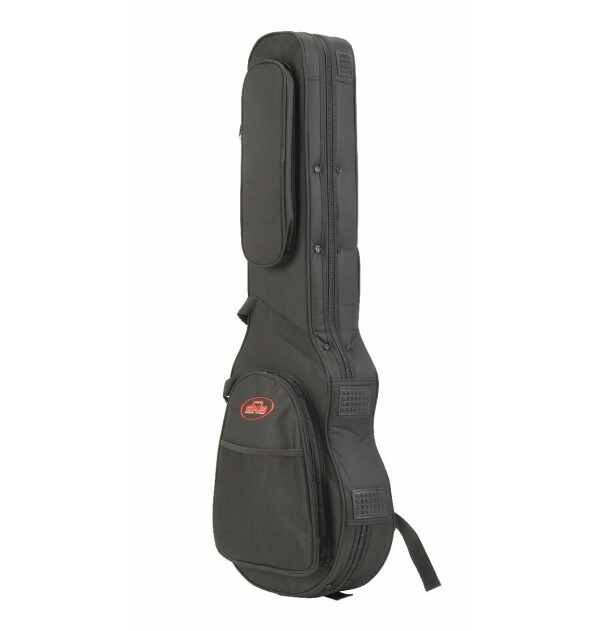 'With an affordable price, a lighter construction and enhanced portability with the padded back pack straps, these cases offer the ultimate in SKB protection for the guitarist on the go", stated Steph Maffei, SKB Product Manager.Gibson Trademarks are owned by Gibson Guitar Corp. and SKB is in no way affiliated with Gibson Guitar Corp.